As seen on The Atlantic Cities and SFist. This map of transit in the San Francisco Bay Area isn't really a map at all. 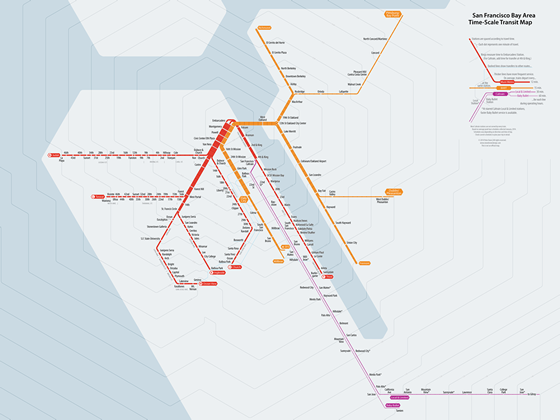 Instead of reflecting the geographic locations of the BART, Muni Metro, and Caltrain systems like a map would, this diagram spaces stations according to the time it takes to travel between them. Places that are farther away on the map will take longer to get to, and closer places are quicker trips. Heading to a neighborhood for the first time? Scouting out someplace to move to? With a quick glance, you can get a sense of how “far” a destination is in terms that are often more important than miles on the ground—minutes of your time. 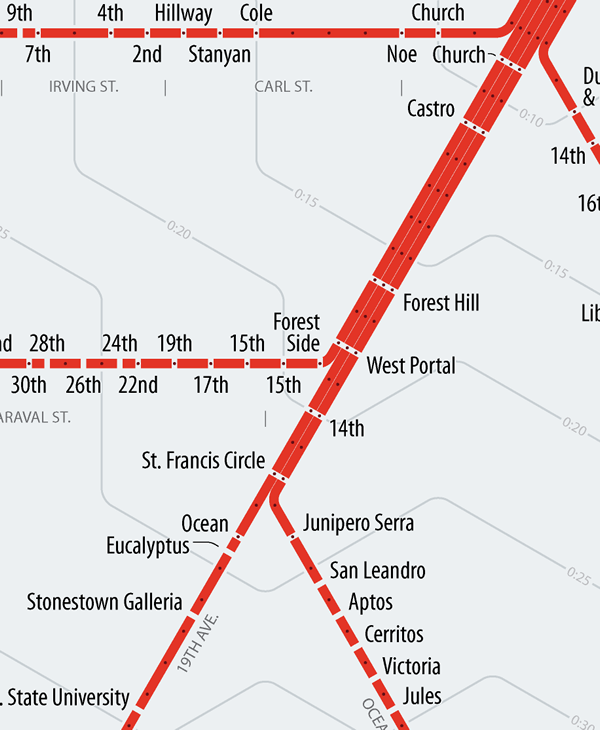 Subway maps are perfect for the time-scale treatment. For one thing, they are rarely drawn to scale in the first place, so viewers are used to some degree of geographic distortion. And unlike cars in rush hour traffic or people walking at their own pace, trains travel at fairly consistent and predictable speeds. The map is still based on several assumptions and averages that won't always reflect reality, so you'll want to check a current schedule to plan your trip in detail. This perspective highlights a few points that are less apparent in other maps. 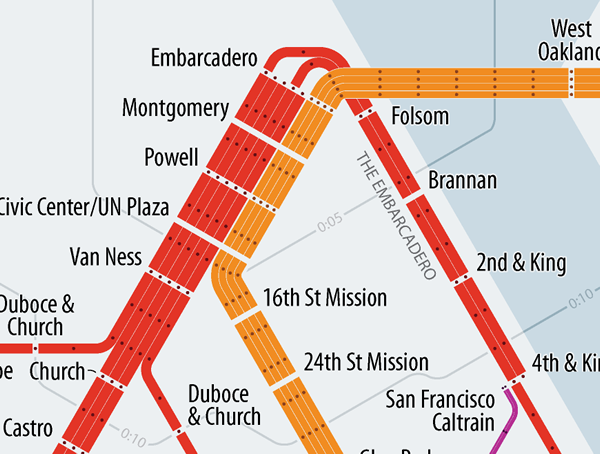 For example, the miracle of the Transbay Tube makes downtown San Francisco closer to the East Bay than to many neighborhoods in the city itself. It's quicker to get from the Embarcadero to Bay Fair (22 miles) or Lafeyette (19 miles) than to Sunset Boulevard at Judah Street (less than 7 miles). 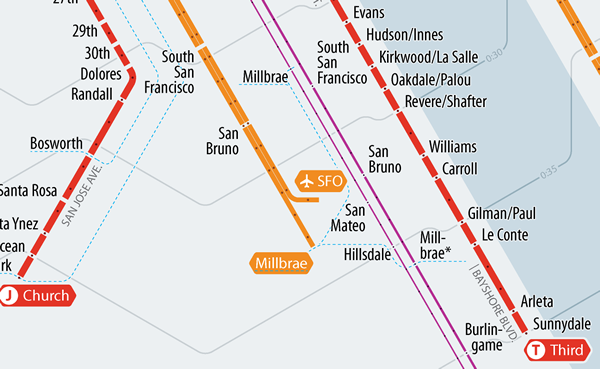 In town, Taraval Street is about a mile farther from downtown than Judah Street, but Muni Metro gets there faster thanks to the Twin Peaks tunnel. On the Peninsula, the commuter rail has the effect of bringing the suburbs much closer to the city. Getting to Redwood City on Caltrain takes only a little longer than riding to the San Francisco city limits on the T - Third, less than one quarter the distance. That doesn't mean that faster is better. Like many urban transit systems, Muni is often ridiculed for having such a slow average speed. One point this map makes, though, is that you can't tell the whole story in miles per hour. The speed of a city bus is slower than a commuter coach, but there's just a lot more city in one mile of San Francisco street than there is in a mile of freeway in the suburbs. What's more important than speed is the amount of stuff—jobs, shops, friends, parks, restaurants, whatever—a rider can get to in, say, 30 minutes. Whether you get there going 60 miles per hour or 8 shouldn't make much difference. By taking distance out of the picture, this map puts a new emphasis on time as the metric of comparison. Why isn't this the official map? For a few good reasons. Schedules can change, and may even vary widely at different times of the day. Strong geographic references are usually an important aid to comprehending transit diagrams, and this map's distortions would be too confusing for riders trying to place themselves. More generally, every design decision in a good transit map is guided by the need to be as clear as possible. One thing that priority usually leads to is spreading out the busy city center and compressing the sparse peripheral areas in the suburbs so that the map reads evenly. When using a fixed time scale, the lines don't have that flexibility. Some areas remain too cluttered, requiring a smaller font size and potentially confusing conflicts. Other areas are quite thin. More than half of the area of the map is empty—not a good use of space when you're trying to catch a glimpse of the map in a crowded station. It's very difficult for a design to successfully serve two goals simultaneously, and the primary goal of this map is to show travel times, not to orient riders on a train to their stop. 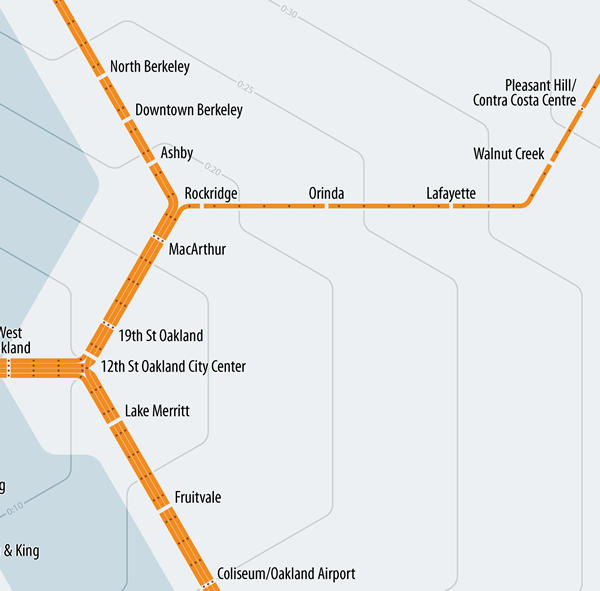 Since none of these systems use colors as the primary way to identify lines (e.g., it's the "J - Church" instead of the "Yellow Line," or the "Richmond-Fremont line" instead of the "Orange Line") I was free to use a simpler color scheme. The distinctive hexagonal grid, based on 60-degree angles instead of the typical 90 or 45, makes a recognizable abstraction of Bay Area geography (despite the bending of San Francisco's regular street grid) while making the design a bit more lively than rectangles. Small dots, evenly spaced along each line, mark one minute of travel time. Easier than measuring by eye, and cleaner than using rings for every minute. After the lines branch out from Market Street, they sometimes reconnect at other transfer stations (like at Balboa Park with BART and Muni, or at Millbrae with BART and Caltrain). Since the travel time to downtown from that station isn't the same on every line, the station has to be shown separately, at the correct minute marking, for each line. A dashed line shows the connection between lines at that station, but it's not as obvious as it would be in a regular map. 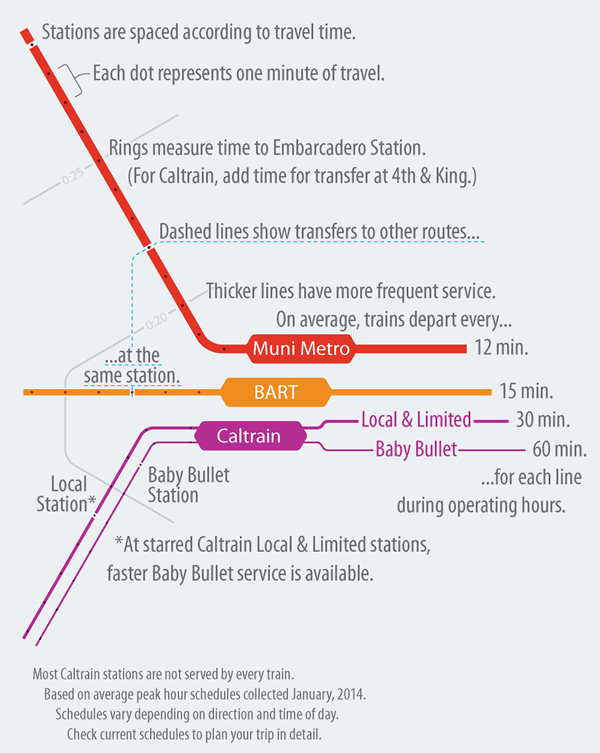 Similarly, Caltrain's Baby Bullet trains provide much faster service at certain stations, but those stations are also served by the slower Local and Limited Stop trains. 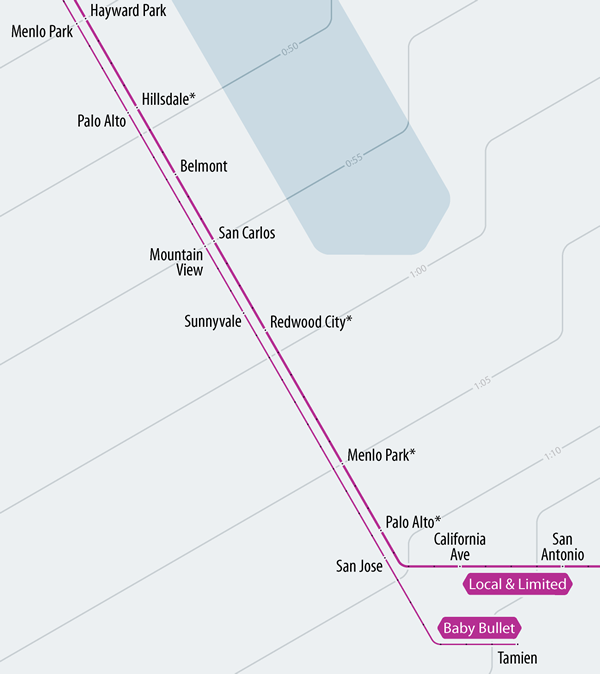 Rather than simply average the fast and slow schedules, the map repeats stations to show them closer on the Baby Bullet service and farther away on the slower local line. The number of minutes spent moving on the train is only one component of journey time. The time spent waiting for the train to arrive is another. Train frequency, averaged over all service hours, is shown by the width of the lines. Where lines converge into thicker band, it's easy to see that you won't have to wait as long for a train. The typeface, from the Myriad Pro family, is not only well-suited for legibility in tight spaces, it's also locally-sourced: designed for Adobe (San Jose), it's used in the corporate identity of Apple (Cupertino) and other area tech companies. I'm still fine tuning the map, and I'd love your feedback. If you think something could be made more clear, or maybe there's a local name the map got wrong, or if you just spot a typo, let me know: info@stonebrowndesign.com.